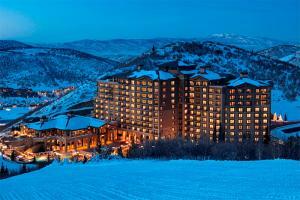 The AAA Five Diamond mountainside retreat is adjacent to Deer Valley Ski Area with ski-in ski-out access. All guest rooms feature spectacular mountain views with St. Regis Butler Service in all suites. The St. Regis Deer Valley features signature service and amenities such as a private ski beach, ski valet, split-level infinity pool, and a full-service Remède Park City Spa. The hotel features 181 well-appointed and luxurious guestrooms and 67 suites offering unparalleled views of the surrounding range. J & G Grill - farm to table cuisine and slopeside views; Terrace Cafe - quick bites; Library - casual dining in a tranquil setting; St. Regis Bar and Lounge - fireside cocktails.